Recently I learned of an acquaintance, a college-aged kid, who sadly took his life through a drug overdose. I hadn't interacted with him for years, though I was connected on FaceBook. Noah was a mere child when my husband and I took care of him and his siblings, around age four. We sat around the kitchen table with him and his older siblings, playing a game of Apples to Apples. He had laid out the card "Soft" and was collecting response cards from all of us players. A bright child, he giggled as he turned over the card I'd donated, "Underwear." Such a pleasure to hear his delightful laugh and watch that childish grin! If only his life held more of that delight in recent days! I believe he knew Jesus, yet lost sight of God's goodness. Life overwhelmed him. I am reminded of another young boy whom I had watched as a teenager. While his mother taught group piano lessons in the basement of her split-level home, I entertained three-year-old Robert. We crashed cars, built block towers, played board games, and ran around in the back yard while his older brothers amused themselves. I told him stories. When he grew up enough to amuse himself while his mother taught piano, I only babysat occasionally, usually late evenings when his parents enjoyed a special date. My little sister occasionally played with Robert, and she shared the good news of Jesus with him. I had not done so, since his parents were atheists and did not welcome such conversations. My sister was perhaps eight at the time, and her friendship with Robert dwindled after her "violation" of their desires. But one day, when Robert was a teen, my mother invited him over to enjoy a family meal. I was in college, away from home at the time. Mom told me that Robert stayed and stayed and stayed. She surmised he must have been lonesome. Or was he waiting to hear good news of salvation? Sometime later, my mother shared upsetting news. Robert had committed suicide by jumping off a bridge. I think back to times that I have been so sad that life seemed unbearable. I understand how problems can become so overwhelming that one can not see a way out, how mistakes and sins multiply to the point of obliterating any hope. But there is hope. God knows our weaknesses; He understands our frame. He cares for us. I don't understand why it seems that God lets some fall, why it seems He doesn't intervene. He is the healer of broken hearts. He is not willing that any should perish. So why doesn't He break through the shell that we build around ourselves, the self-imposed shell that isolates us from others? Is the love of God thus wasted? The only answer I can see to my questions is faith. It seems questions always come back to that truth. We're human. God is, after all, God. He doesn't have to answer our doubts and criticisms (though He sometimes eventually does, as Job learned). God invites us to draw near to Him, to set our affection on Him, to trust, to have faith. I choose to believe the promise of God's Word that nothing can separate us from the love of God revealed in Christ. Not fears, not death, not the powers of hell. I hope you do too, even if you have to cry out, "Lord, help my unbelief!" Here I am opening a thank-you gift from a parent who owns Zhi Bath and Body - wonderful hand-crafted products! Let me explain. 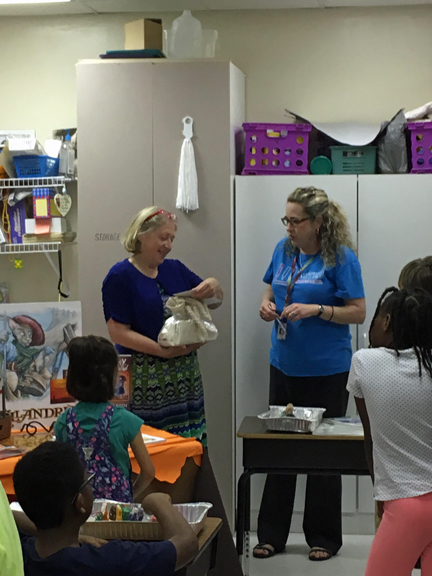 Back in September 2017, I visited my granddaughters' classes at United Community School in Charlotte, NC and read a story as part of a birthday celebration. I read the "Turgin's Magic Bauble" chapter from my Legends of Ellandria book, but I enhanced the reading with props. I also read several of the children into the story as Turgin's friends. Both the first-grade class and the third-grade class loved the experience! Afterward my daughter-in-law kindly forwarded a parent e-mail from the teacher of the third-grade class highlighting that week's activities. Her response was very positive. Within the next week, I received a thank-you letter from each child in the class. Wow! I was so impressed. I decided to answer each one personally. I mailed the letters to Mrs. Cooke at the school thinking "Let's keep the ball rolling. What kid doesn't love mail?" An idea grew in my mind. Now that I have this connection with the students, what would happen if I volunteered to come back and teach them how to write a story? I worked out a plan and contacted Tracey Cooke. She accepted my proposition and bravely launched a year-long writing project. So began a series of mid-week trips to Charlotte (Wednesday is my day off work at Park Place Children's Center). I returned November 1 to read my story of "Harley and the Hermit's Garden" and to talk about story settings. Mrs. Cooke kindly granted me plenty of time (8:20 to 9:30), and so I built an activity into the lesson. The children molded their setting out of white Crayola air-dry clay. They had so much fun! On November 15 I returned to talk about characters. This time I read "Whimsy Gatan and the Happy Wanderer." The children each chose an animal character for their stories, and they made character sketches using oil pastels on card stock. They loved the brilliant colors and different texture of that media. As a precaution, I taped a sheet of onion-skin to the top edge of each student's cardstock to prevent smearing. I also left non-fiction books on various animals so that the children could read up on the characteristics of the animal they'd chosen. On December 6 I talked about the basics of plot. I read excerpts from Rikki-Tikki-Tavi (illustrated by Jerry Pinkney), Best Friends for Frances, and one of Richard Scarry's stories about Huckle Cat and Lowly Worm fishing with Father Cat. With Mrs. Cooke's help, I projected posters from various animated movies. The children were so excited about identifying different types of conflict in the movies they'd seen. They started brainstorming about all the problems their characters could have or all the bad things that might happen. Mrs. Cooke taught the students more about plot, and I returned on January 10 to talk about story-boarding and illustrations. I wrote a new story, "Whimsy Gatan and the Crest of Fathom," to use as an example of breaking a story down into pages that play up action-filled illustrations. I showed them different pictures my illustrator (Scotty Roberts) had revised. I also talked about all the hard work and patience that the editing and publishing process requires. The students started a book cover and teaser on an 11x17 piece of cardstock. I left large sheets of newsprint for Mrs. Cooke and showed her how to fold the paper into a signature to form a booklet. Mrs. Cooke helped the students make the booklet for their rough drafts, and the students launched into writing their stories. Mrs. Cooke was able to have the rough drafts delivered to me before I returned. 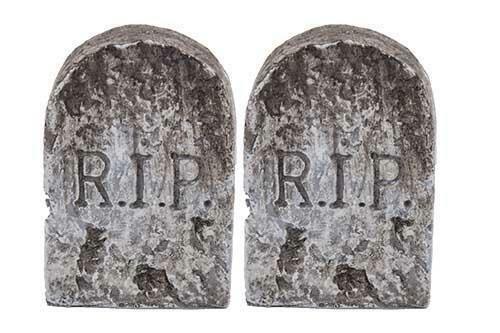 On my January 24 visit, I returned the rough drafts with editorial comments. I read five of the students' stories aloud, and we discussed them together. We asked such questions as "What did you like about the story?" and "What did you want to hear more about?" and "What part confused you?" The children loved participating. Over the next few months, Mrs. Cooke worked with the children individually to finish and revise their stories. She sent me the revised drafts, and I keyed them into an 8.5 by 11-inch template. I printed the pages on cardstock and slipped them inside sheet-protectors in a folder with a transparent cover. Presto bingo! Instant book! The children loved seeing their names in print and marveled over the copyright page. They added their illustrations. 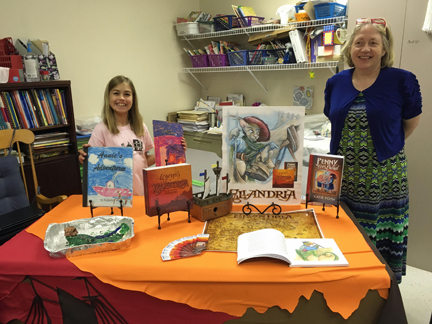 Mrs. Cooke wrapped up the project with a wonderful Meet-the-Author event. 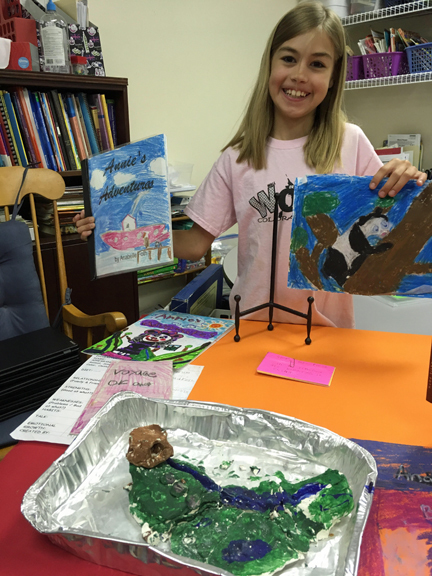 Her newly-published students displayed their painted setting, their character sketch, their cover and finished book. I attended the event and was so pleased to see the wonderful illustrated stories. Many parents attended (besides the owner of Zhi Bath and Body) and appreciated the finished product. Students beamed with pleasure, so tickled to be a "published" author. That made parents proud too, and I'm tickled. I hosted a display alongside my granddaughter, who was bouncing on her toes with excitement, but I spent most of the event enjoying the students' work (my granddaughter and family enjoyed frozen yogurt together later in the afternoon...I didn't neglect her). Wow, Mrs. Cooke! I thank you for the opportunity to work together to inspire interest in books and to encourage writing skills. As a former English teacher, I think I have a good idea how much hard work and patience you must have expended in guiding such a big project through to a glorious end. Your students are so fortunate to have you! Wow! It's June, and I've frittered away three whole months without posting a thing. Well, not exactly "frittered." At the beginning of February, I accepted the position of full-time teacher for the Goldfish Class at Park Place Children's Center, and I've been working hard to keep my class interesting and my students engaged in learning. The kids love seeing what's in my surprise box... almost always something that goes with the letter of the week. 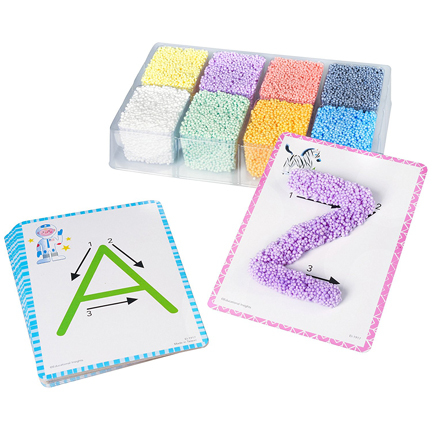 They loved the tacky texture of the Educational Insights PlayFoam Shape & Learn Alphabet Set. What good practice for developing fine motor skills! Rolling balls fascinate and delight young children. The safari elements of the Imaginarium Discovery Safari Marble Run attracted my students initially. 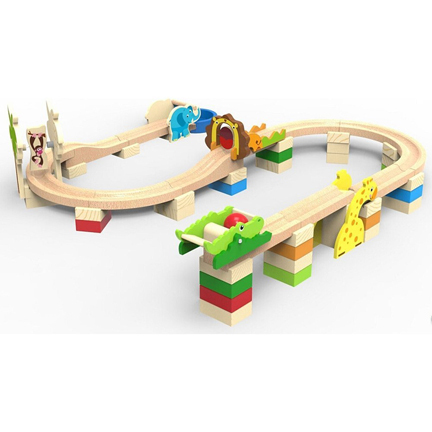 I had to teach them how to be gentle with the stacked blocks and movable track, but the children were hooked once we started rolling balls. One bright child even started building his own run after a few days. This set is great for experimentation. We discovered that the monkey-spinner slows the ball down so it doesn't jump off the track on the curve that follows. The elephant needs to be placed right after an incline so its trunk doesn't trap the ball. Small superballs, ping-pong balls, and plastic golf balls will roll down the track, but they're too big to pass through the monkey-spinner. Smaller metal marbles are too heavy and jump the track on curves. The colored wooden balls that come with the set are perfect. 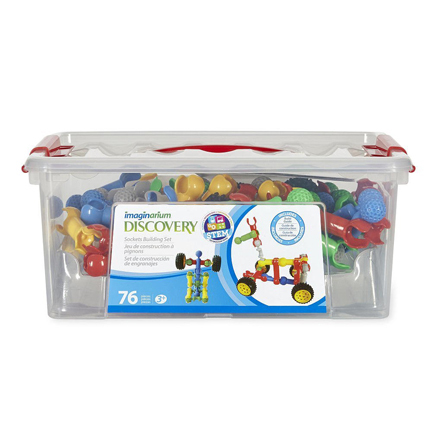 The Imaginarium Discovery Socket-Building Set became an instant favorite for table toys, especially after our unit on outer space introduced the idea of robots and moon buggies. Of course, the boys are always drawn to constructing swords or guns, which I do not allow them to use in class. 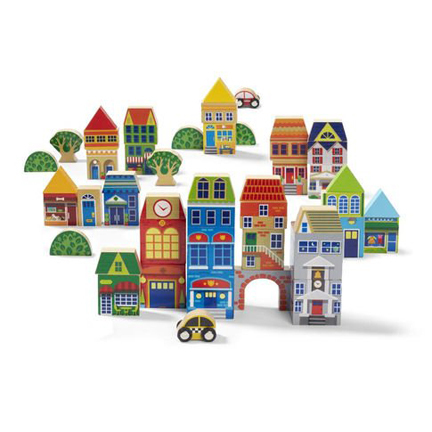 The Imaginarium City Blocks Set immediately caught my eye and brought back fond childhood memories of building a village of blocks. The blocks are painted to look like a police station, fire station, grocery shop, bistro, dress shop, etc. My three-year-old friends especially liked the two bridges and the little cars that go under them. 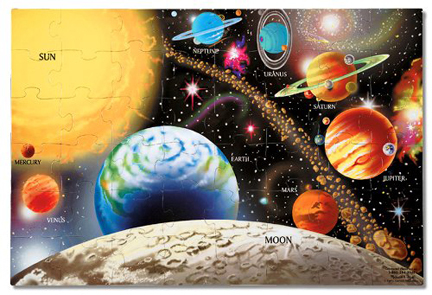 My three-year-old friends loved the Melissa & Doug Solar System Floor Puzzle, and I love that the exercise of putting together the shiny 48 extra-thick cardboard pieces demands the development of spatial skills and experimentation (rotating the piece to see if it fits). Children also learn to notice and match details (purple Pluto, Saturn's rings), and they learn to persist in their efforts until they're rewarded with the whole fantastic picture. Great skill-building! There are lots of different magnetic-tile products available. My preschool ordered a variety pack similar to the Jolly Mags Set. The children love making garages and rockets and even pizzas out of the magnetic pieces. They're almost always in use! My list would not be complete without Crayola Play Dough. What child doesn't love the stuff? 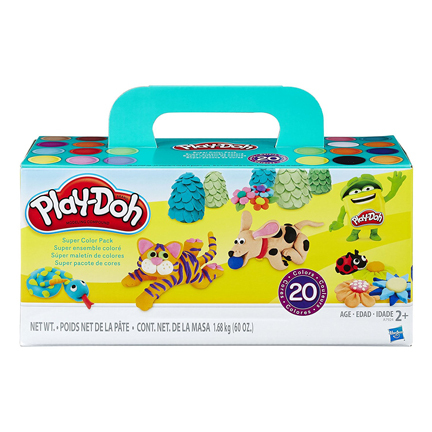 I usually buy the Super Color Pack of 20 medium tubs so that there's a different color for each friend in my class (my school allows a group up to 14 in my class, though I usually have a few less). The children love the box of plastic tools--rolling pins, knives, scissors, pizza cutters, cookie cutters, and extruders (for making funny-shaped hair or noodles). 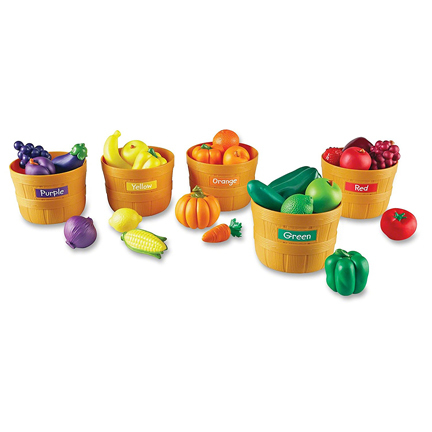 I bought my Learning Resources Farmer's Market Color Sorting Set in early February, before Toys 'R Us announced its closing, and I haven't at all regretted the money I spent. The children loved showing off how they could sort the fruits and vegetables. They enjoy adding other plastic food items they've found in the play kitchen, such as yellow pineapple slices and green pea pods, okra, avocados, and asparagus. Add a shopping basket and a cash register, and you're ready for loads more fun. The Learning Resources Counting Cans Set and the Learning Resources A to Z Alphabet Groceries Set are nice additions to a store. 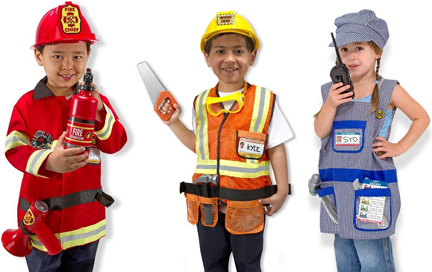 Melissa & Doug offer some of the nicest, most durable dress-up costumes for preschool children. It's hard for me to say which of the four costumes in my room is the most popular: the construction worker, police officer, fire-fighter, or doctor. They're all in frequent use! Each dress-up set comes with great props, most of which fit inside the pockets of the costume. I've installed plastic hooks on the wall, along with a picture of each costume. When I first introduced these costumes, we practiced matching up the accessories to the costume, then matching the costume to the picture above the hook on the wall (where the costume is stored). The children don't always remember to put their costumes away properly, but they do know exactly where to return them when prompted. Oh, my goodness! The children have had so much fun parading around the room to strains of John Phillips Sousa's rousing marches, particularly on rainy days. 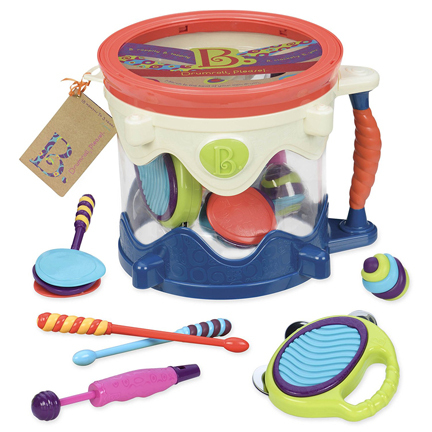 My collection of musical instruments comes from various sources and includes tambourines, drums, jingle bells, cymbals, plastic recorders, castanets, maracas, rhythm sticks, harmonicas, kazoos, a xylophone, and a triangle. I've taught them to wash off certain instruments (recorder, harmonica, and kazoo) before using, and they enjoy using the sink to do so. That's it! 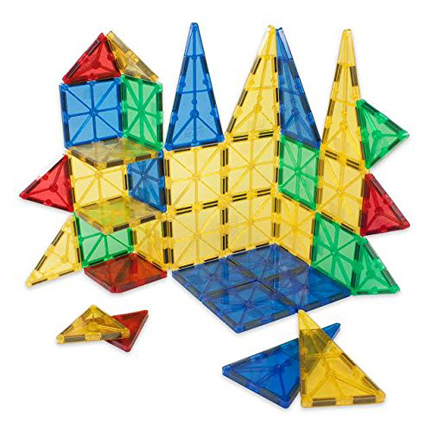 I have a few more toy sets I'm saving for later (Imaginarium Froggy Dominoes, Imaginarium Geometrics Building Set and Imaginarium Robot-Building Set). As you may guess, I'm a proponent of developing the mind along with the muscles! One of the joys of working with children is watching their humor develop. 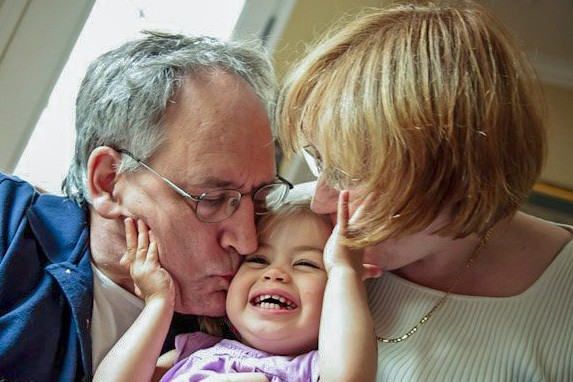 For a young child, humor is typically simple. If I point to my nose (a label they know well) and call it my ear, they giggle. Playing dumb is rather fun: "Oh, that's my nose, not my ear? Oh, then this must be my ear!" (I point to my eye). More giggles. Eventually, one of the kids tells me that I am all mixed up. We laugh, and the game is over. 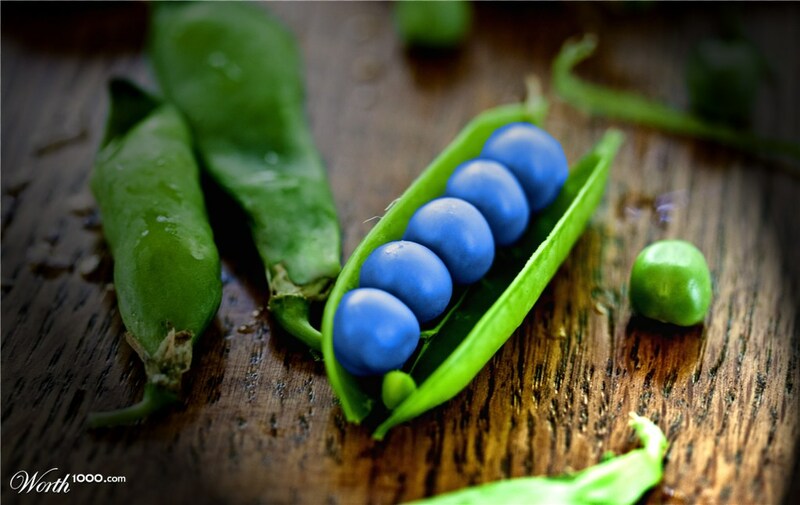 One of the boys in my class has picked up on this humor and tries to trick me into thinking my peas are blue. He laughs when I smile and tell him he can't fool me. My peas are green! He's the one all mixed up. Yet look at the picture above! Someone must have found (or made) blue peas. I'm not telling Dylan! A few days ago, I enjoyed the simple humor of mislabeling from a different angle. Teachers at Park Place Children's Center are encouraged to sit down and eat lunch with the children to model manners and increase conversation. Rather than consume the children's milk, I brought a beverage for myself that day. I set my bottle next to my plate and announced, "Look what I have! I brought vitamin water to drink." One of the boys looked at me strangely. "Spiderman water?" he asked. This particular child loves pretending to be a superhero like Spiderman. Spiderman must have been on his mind. And one must admit that the cadences of "Spiderman" and "Vitamin" sound a bit similar. I smiled and said, "No. My water is red like Spiderman, but it's VITAMIN water. 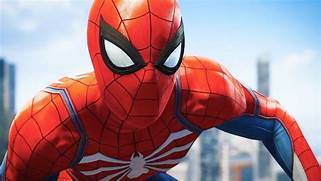 Do you think Spiderman drinks vitamin water to keep himself strong and healthy?" A confused look passed over his face. I'm guessing VITAMIN was a new word for him, and he had no idea what it meant. I didn't try to explain. His confusion prompted me to think differently about vitamin water. Note the picture of Spiderman above. Do you see a mouth? Peter Parker may drink, but Spiderman must apparently rehydrate differently. But if there were vitamin water that gave Spiderman his "spidy" powers, I'd probably buy some and try it. Wouldn't you? Some enterprising marketer has missed an opportunity!